Nova Chastain, the Falconer, member of The Council of Twelve, is sending out her beloved birds to deliver the day’s solemn message: Anders, Prince of All Archenfield, is dead. The young man she supported is gone and the Twelve is broken. As she dispatches her last bird a lone rider on horseback heads towards the hunting party, no doubt to deliver the news to the late Prince’s younger brother. When the news reaches young Prince Jared, as his brother’s chosen successor he not only faces an early reign that he had not as yet hoped for, but also the task of finding his brother’s assassin and hoping that their eye is not trained on him next. With the death of his brother obviously carried out by someone within the palace – someone who had proximity and opportunity – Jared will have to place his trust in someone outside of his inner circle. 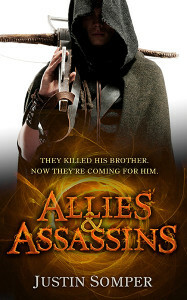 Allies and Assassins brings us the familiar story of a reluctant prince who inherits his throne too early in life and has to swiftly assume the responsibilities that go hand in hand with ruling a kingdom as well as finding the maturity to make the decisions expected of him with the confidence and noble grace of a ruler. The narrative progresses day by day, from Prince Anders’ murder through to the day Prince Jared must officially accept his crown, and takes the form of a simple, linear murder mystery, with the clues being revealed as the plot progresses. 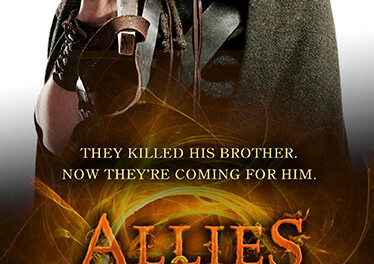 The end of this book is reached rather swiftly and it leaves a larger piece of the puzzle to be explored in the sequel. There is a rather splendid section at the back of the book – The Archenfield Archive – which provides a description of the all important Twelve, a family tree, and a summary of each of the bells that chime throughout each day and their meanings, which is a nice touch in helping to solidify a world that we only see a very small part of in the book. Overall it is fair to say this story is directed at the younger reader and has a level of depth, characterisation and complexity to match that.